Jennifer Donnelly is quickly turning into one of my favorite authors, a beautiful find in the literary world. After reading her novel The Winter Rose (sequel to the Tea Rose), I realized I’d stumbled across another gem with an amazing talent, a love of writing and a gift of storytelling. Her latest release, Revolution, will have a sweeping appeal across the board to both adult and young adult readers alike. 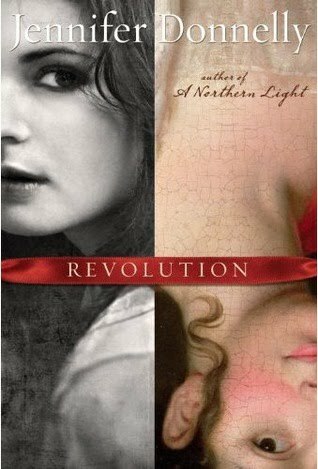 Revolution is an intriguing tale that weaves historical fiction with the gritty edge of young adult drama. Andi Alpers is a troubled teenager living in modern-day Brooklyn. On the surface, she has everything to hope for; she’s highly intelligent, exceptionally talented as a musician and is attending an exclusive, private school in New York. Alexandrine Paradis, the alternate protagonist in this novel, becomes the voice of two centuries past whose words come to the living through a diary Andi later finds while on a trip to Paris. It quickly becomes apparent, in this double-entendre, that each woman has a radical change, a revolution of her own that she is destined to face. Andi’s family has been torn apart by an unexpected tragedy. She’s suffering from guilt and the grief of having tragically lost her younger brother Truman two years earlier. Her mother, with limited ability to cope, has retreated in her own shell, while her father, a Nobel Prize winning geneticist, leaves them, unbeknownst until later, to their own disarray. But while Andi repeatedly has suicidal thoughts, she immerses herself in the art of her own music to find a place of solace. Eventually, the rage catches up to her. Andi is close to expulsion from her elite high school when her father suddenly becomes aware of the circumstances of the family now falling apart in his absence. Taking action to settle the situation, he checks her mother into a mental institution (much to Andi’s contentious disagreement), and takes Andi with him to Paris where she is to work on her senior thesis of guitarist Amadé Malherbeauand of the 18th century where Andi’s life is about to take another turn for the unexpected. While lodging with a friend of her father’s, a renowned historian, Andi eventually discovers Alexandrine’s diary, a young teenager who lived 200 years ago during the bloodiest battles of the French Revolution and who served Marie Antoinette and Louis XVI in their final days, each of whom were doomed to the guillotined. Though Alex had dreams of being an actor, she found herself serving as companion to the young dauphin (the son of Marie Antoinette), to whom she had grown close and become so considerably fond of. Jennifer Donnelly has a writing style that induces the deepest emotions from the reader. Though Andi would seem a more relatable character since she and I are of the same era, there was something about Alexandrine’s harrowing desperation, her vivid description of what she witnessed in her time that whirled me into her storyline. I felt myself there, in her shoes, at the palace in the midst of the revolutionaries’ increasing aggression. I’d briefly touched on the French Revolution in highschool, and my last fictional encounter of it was in Charles Dickens’ A Tale of Two Cities. But Ms. Donnelly gave me a ticket to another venue with a front row seat. A literary performance that brought me to the action of this historical calamity between the aristocracy of France and the peasantry whose uprising proved too brutal in making their point. Interestingly, Andi’s father is performing genetic tests on a small heart believed to belong to the young dauphin who was imprisoned under inhumane conditions by Robespierre (a terror and influential figure of the French Revolution). Andi feels a gut-wrenching compassion towards the young child’s plight and agony, I imagine for reasons that he was, for her, her Truman equivalent. Through Donnelly’s spell-binding storytelling, I reached a level of understanding of the French Revolution in ways that no history book has ever been able to do for me. Donnelly is also accomplished in her historical research, and diligently does her work in gathering pieces, taking you through the streets of Paris in both its past to present state, while showing a startling contradiction, that dividing line of two worlds, one crude and unpleasant, an era of marked discontent, the other boisterous and full of new life, equality, both separated by nothing more than intangible time. Through this novel, Jennifer Donnelly has written a story that explores the theme of good and evil, and having the courage to ask questions “How could something like this happen?” of a time and place where horrific atrocities ran rampant and became commonplace. Unimaginable to us living in the modern-day United States, how could something like this be allowed, especially to young children? We often see this in themes of war. Why is it that people, in their gain for wealth and power, shed their humanity in their sociopathic pursuit for earthly gains that are never really permanent? Does war, any war, even if it were to take place today on any continent, really provoke unspeakable evil? Or, do such unspeakable acts become a necessary evil? Depending on the perspective of victim versus survivor. Of one whose witnessed such iniquities that they are pushed to the brink of having to take action to change the politics and institution that suppressed them. After all, isn’t anger the reaction to an unjust? And what is unjust? The suffering of the peasantry, the revolution that followed to bring democracy to France? Or the price that would have to be paid for a new democracy to come about? And let’s not be so mighty as to rank ourselves above our ancestors. Is it possible, could it occur from any of us for that matter? Since people are people, after all, we are linked together, regardless of time, space and era? Though we like to think of ourselves as being ‘above it’, are we all as equally capable of such monstrosities? Or can we learn from the past though authors like Jennifer Donnelly who are here to remind us, from a more sober perspective that we’ve gained as a society, the events of the past that left its stain? Everyone has somebody that they love, and as you read this book, the characters within it will draw such a parallel for you. Revolution is highly recommended to both new and veteran readers of Donnelly’s work. Follow my post to my website, http://debrahutchens.com/blog/, where a brief discussion and video on the french revolution follows. This is one book that will carve a deeper understanding, a greater awareness, and excite an appreciation for an epoch in history that is worth remembering.